Dietary Supplement. Overdrive. High-Performance Gear for High-Performance Athletes. Accelerates dense, permanent muscle growth. Supercharges endurance; Buffers lactic acid. 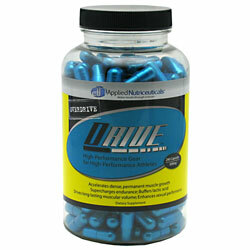 Drives long-lasting muscular volume; Enhances sexual performance. (These statements have not been evaluated by the FDA. This product is not intended to diagnose, treat, cure, or prevent disease.) ---A4E2 ATP Synthase (Proprietary Blend): Cordyceps (7% Cordyceptic Acid), Dodder Seed Extract (20:1 Cuscutta Chinenses), Naringin (98% Extract). Star 3, 5 Anaplex (Proprietary Blend): Epimedium Extract (40% Icariin), Forslean (20%). This product is only intended to be consumed by healthy adults, 18 years of age or older. Do not use if you are pregnant or nursing. Before using product, seek advice from a physician if you are unaware of your current health condition or have any pre-existing medical condition including but not limited to kidney disease or if you are taking any prescription or over the counter medication. Do not use if you are pregnant, nursing, prone to dehydration or exposed to excessive heat. Discontinue use and consult your health care professional if you experience any adverse reaction to this product. Before beginning any weight loss program, consult your health care provider. Store at room temperature and avoid excessive heat. Do not use if inner safety seal is broken or missing. Keep out of reach of children.